At Crazy Willy’s place, the sound of one cricket, strayed from the million cricket orchard posse, is so maddening it keeps Willy awake. I once heard that a buddha developed a nervous disease because he wouldn’t kill a cricket. Once, he thwacked a cricket with a tuxedo thong; a keepsake from that time he won a stripping contest. I have found him ear pressed to the heating vent, wielding a baseball bat, a wire hanger, a trumpet. We have pulled the stove oven from the wall at four in the morning. A gray fog hangs over the orchard which is showing signs of early yellow autumn; bird nests have been abandoned, critters hustle for their winter food supply, and Canadian geese get fat on dwindling crops. All the peaches and plums have been picked but there’s an abundance of apples still. This year’s rain made the Macoun apples purple and the Empires a deep sultry red. 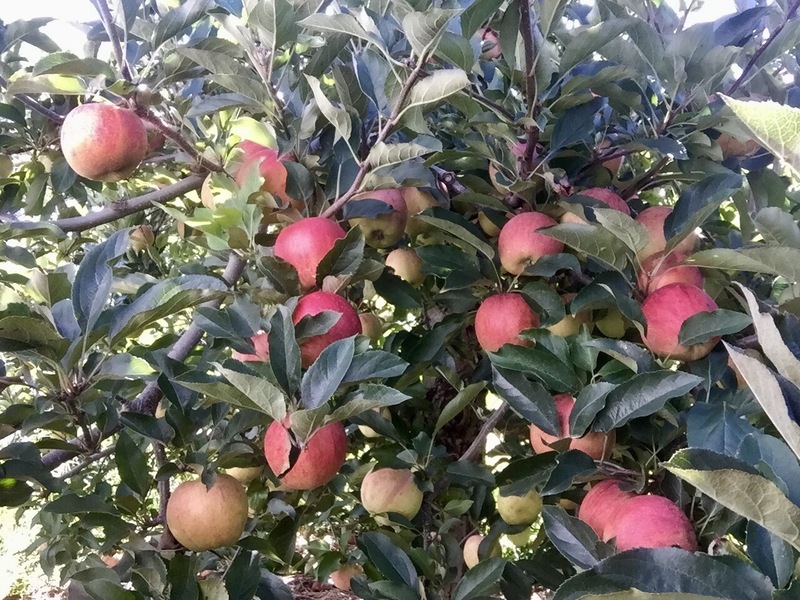 The Galas are sweet and a beautiful yellow and reddish orange, but pale in comparison in taste to the Honey Crisp. Sweet is nice, but I prefer the spicy Jonathan. Apple picking is arduous. On this farm, you pick into a vintage metal bucket that hangs from your neck, and when it’s full, the weight of the apples makes maneuvering around the trees more difficult; especially since apple trees are tough and have sturdy branches that protect and shield their fruit. But the cool dry air of autumn and shade provided by the apple trees makes work more comfortable, especially compared to picking tomatoes in 90 degree humid heat. There were many days I didn’t get a shade break, except at lunch, and got so dehydrated once, I had to go to the hospital for fluids. I’ve never had to do that, and I’ve walked thousands of miles under the hot desert sun, and through 100+ degree temperatures in Death Valley. Heat exhaustion and dehydration are common ailments migrant farm workers succumb to and have died from, amongst other things.